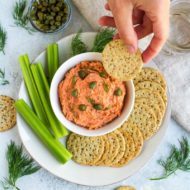 Looking for a healthy game day snack? 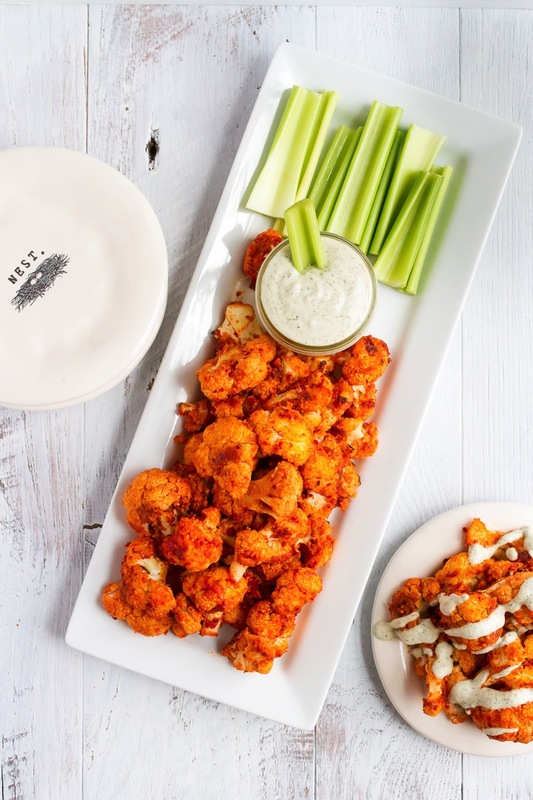 Try these buffalo cauliflower wings with a creamy cashew dressing. They’re absolutely delicious and easy to whip up. Vegan + gluten-free. Football season is here, which means fantasy teams, game day parties and snacks galore. My favorite game day snack is chips and guac (my healthy guacamole is the best), but everyone else seems love wings. I’ve honestly never been a huge fan of wings (I don’t like eating things off the bone), but as soon as I saw the idea for cauliflower wings I knew I had to try them. Just last week I finally got around to testing a cauliflower wing recipe and guess what? They’re just as good as I imagined and way more appealing to me than regular wings. Maria and I both loved the cauliflower wings, but I figured I needed to test them on guys so yesterday I made another batch for Isaac and his brother, just to be sure they’re dude-approved. Rest assured, the guys ate these babies without any hesitation and gave them a solid two thumbs up. Boom! 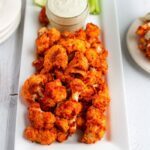 Basically this recipe proves that roasted cauliflower is insanely delicious… especially when coated in an almond flour breading and tossed in a buffalo wing sauce. Also, cashews make the creamiest vegan ranch I’ve ever tasted. I’m in love with the dressing and I kind of think it needs a post of its own because it’s so good. Looking for a healthy game day snack? 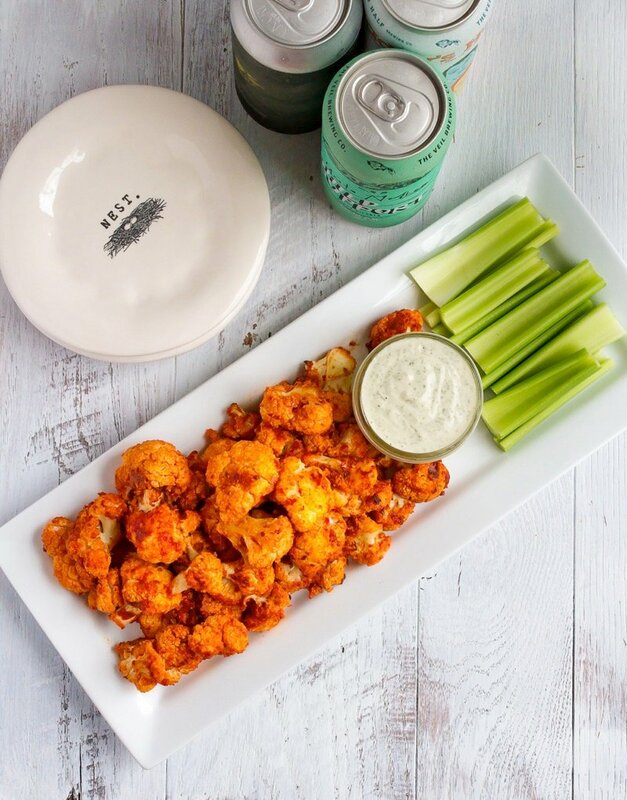 Try these buffalo cauliflower wings with a creamy cashew dressing. They’re absolutely delicious and easy to whip up. Add almond flour, water, oil and garlic powder into a large bowl. Stir to combine. Add cauliflower florets and toss to coat. Spread coating cauliflower onto a baking sheet lined with parchment or sprayed with cooking spray. Don’t skip this step or the cauliflower will stick. Bake for 30 minutes, tossing once at the 15 minute mark. Remove pan from oven, pour wing sauce over the cauliflower and toss to coat. Set oven to broil and broil cauliflower for 5-7 minutes. While cauliflower is roasting, add soaked and drained cashews into a high powered blender or food processor with 1/2 cup water, dill, garlic powder, onion powder, salt and pepper. Blend until smooth. 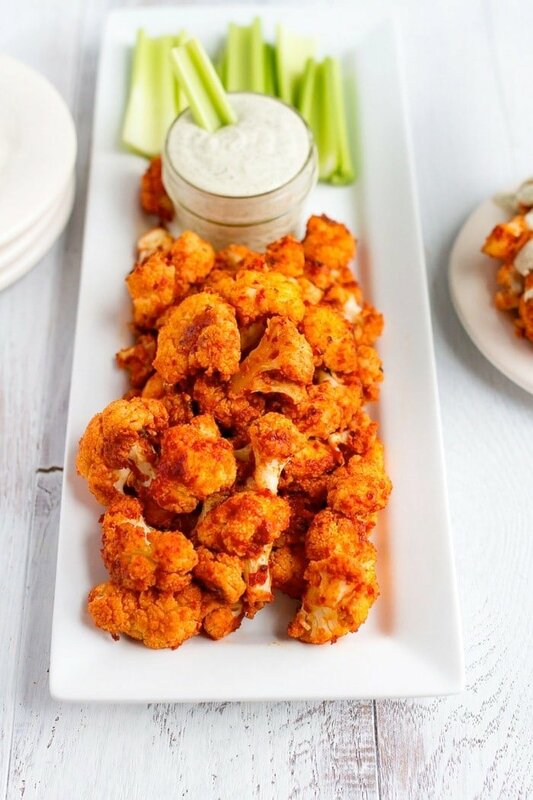 Serve cauliflower wings with cashew dressing and celery. * For the wing sauce, I used Steve’s Paleogoods Paleo Chef Wing Sauce, which is gluten-free and refined sugar free and definitely my first choice if you can find it. Tesssemae’s Hot Buffalo Sauce is another brand I would recommend. 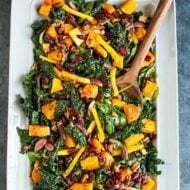 If you want to try a homemade version, this one is vegan and looks great. If you’re in a pinch, Frank’s Red Hot Wing Sauce also works and is still vegan, just isn’t as clean. Love the wing idea! The cashew dressing looks escpecially good. Thanks Genie!! The ranch cashew dressing is so good. Even if you don’t try the wings definitely make the dressing. I’ve been searching for a healthy snack for tailgate season that the crowd will still love! This looks like the perfect balance of health food and football goodies. Yum! These look delicious! I know what I’m bringing to my work potluck this week!! Yay!!!!! Everyone will love these. Hi Rita! Thank you so much for pointing this out! The notes section wasn’t showing up. I added them to the recipe. For the wing sauce, I used Steve’s Paleogoods Paleo Chef Wing Sauce, which is gluten-free and refined sugar free and definitely my first choice if you can find it. I found it at Whole Foods in the condiment section. Tesssemae’s Hot Buffalo Sauce is another brand I would recommend. If you want to try a homemade version, this one is vegan and looks great. If you’re in a pinch, Frank’s Red Hot Wing Sauce also works and is still vegan, just isn’t as clean. Yum! Can’t wait to try these! Thanks! I don’t understand why you say that Frank’s Red Hot Wind Sance isn’t as clean? Hi Kathryn. Here’s the ingredient list for the wing sauce: Distilled Vinegar, Aged Cayenne Red Peppers, Salt, Water, Canola Oil, Paprika, Natural Flavor, Xanthan Gum, Natural Butter Type Flavor And Garlic Powder. SOunds so good!! Any substitute ideas for almond flour? You can use another flour if you’d like! Let me know how it turns out. 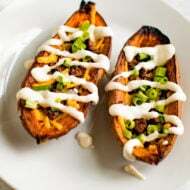 I made these and followed the recipes exactly. They turned out delicious and everybody loved them. Absolutely loved this dish. My husband added chil sesame oil to the dressing and pow it is amazing.